Aga Girls: Seville Orange Marmalade. Following the success of my christmas hampers last year I intend to make them again this year. However I thought that I would be a little more prepared this time and try to make things throughout the year rather then being limited by both time constraints in December and what ingredients I can get hold of. Therefore when I discovered seville oranges in my local green grocers I simply could not resist. For the princely sum of £2 I purchased a kilo of them. Anyone who knows me will attest to the fact that I am pathetically easy to distract, even at the best of times; so with great self restraint, but to my flatmates collective horror I froze my them, proceeding to take up the majority of our freezer space. Society tells women that no matter how hard we try, we will all at some stage find ourselves emulating our mothers. On overhearing my father complaining about how my mother has filled her freezer with oranges that she is never going to get around to doing anything with I was filled simultaneously with a sinking feeling of panic and determination to do battle with marmalade! Measuring 4 pints water into a pan. Squeeze the juice out of all the fruit. Add the juice to the water and place the pips and any bits of pith that cling to one side (don't bin them). Cut the orange peel into quarters and then cut each quarter into thinnish shreds. As you cut, add the shreds to the water and any pips or spare pith to the pile you are saving to one side. 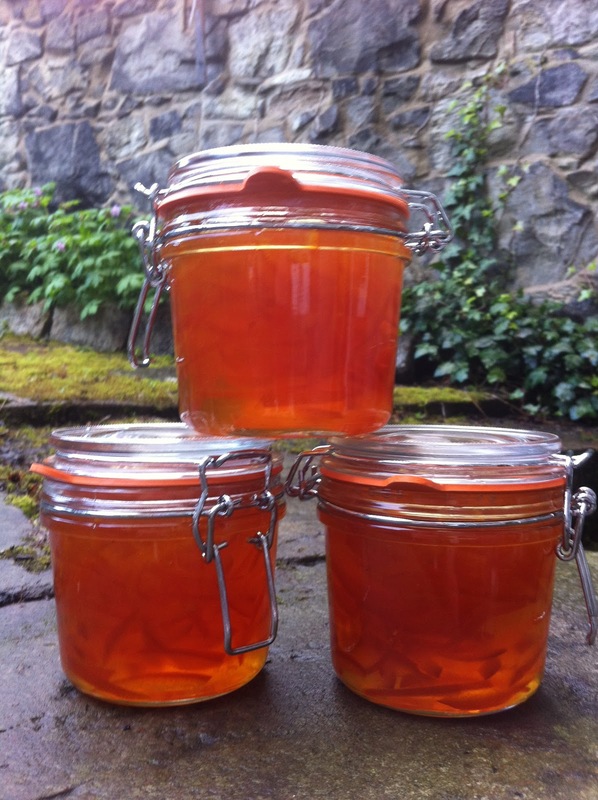 The pith contains the pectin which will set your marmalade, so don't discard any and don't worry about any pith and skin that clings to the shreds – it all gets dissolved in the boiling. Tie the pips and pith up loosely in the muslin to form a little bag, and tie this on to the handle of the pan so that the bag is suspended in the water. At this point I left it over night as I ran out of time to deal with it but this is not compulsory. Next bring the liquid up to the boil and simmer gently, uncovered, for 2 hours until the peel is completely soft. Remove the bag of pips and squeeze it between two saucers to get all of the juice and pectin out of it.. Then pour the sugar into the pan and stir it occasionally over a low heat, until the sugar has dissolved. Then increase to a high heat once the mixture begins to boil time 15 minutes. Once it has boiled for this long test whether it has reached its setting point by spooning a small amount onto a cold saucer and let it cool for a few minutes in the fridge. Once it has cooled if when you push it gently with your finger it wrinkles across the top then you have succeeded. If not then boil it for a few minutes longer and try again. Remove from the heat and scoop off any scum if their is any. Leave the marmalade to cool for 20 minutes or so before putting into sterilised jars as this stops all the peel from sinking to the bottom. This filled approximately 6lb jars. I remember going to seville in december just a few months ago, and there were these gorgeous oranges on every tree! really, just roadside trees, not even in an orchard or sth! It was amazing! this brought back some beautiful memories (: marmalade looks spanking brilliant! Rolled and Stuffed Lamb Breast.